Hi, just a quick question regarding breakout pro. Is it physics based, or is the physics scripted in playmaker? Breakout Pro is entirely physics based, however it does force certain interactions in order to get the desired behavior. For example, the paddle will not reflect the ball according to the balls trajectory, but rather according to the zone it lands on within the paddle. I am interested in turning your word game into a spelling game with text to speech capability. Do you know what text to speech asset would work best with your wordgame? the spelling game would require to listen words and to find them within the gride. P.S. I am new to playmaker coming over from Construct 2. I don't have any direct experience with text to speech plugins, but I have heard good things about "RT-Voice." It includes Playmaker actions according to the description, so this is probably a great place to start. Keep in mind, there is no word finding algorithm built into my word game template, so you will have to create your letter tile layouts by hand, rather than randomly generating them. Breakout Pro is currently 30% off! Take advantage of the Unity Asset Store madness sale until May 11. A small build issue has been brought to my attention which seems to be affecting the most recent versions of Unity 2018. While in the editor, bricks should break as expected, however upon building the project you may notice that bricks will no longer break. I have a solution and will be releasing an update as soon as possible. In the meantime, I have attached simple instructions that you can follow to resolve the issue yourself. These steps will have to be performed on each scene. 1. Place the Bricks Level prefab inside the Bricks gameobject in your scene. 2. 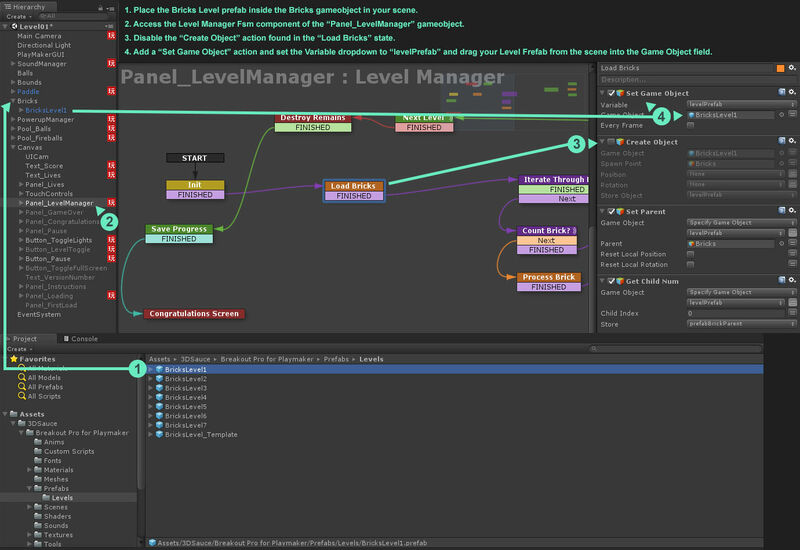 Access the Level Manager Fsm component of the “Panel_LevelManager” gameobject. 3. Disable the “Create Object” action found in the “Load Bricks” state. 4. Add a “Set Game Object” action and set the Variable dropdown to “levelPrefab” and drag your Level Frefab from the scene into the Game Object field. Fix is now live on the Unity Asset Store and 3DSauce.com!